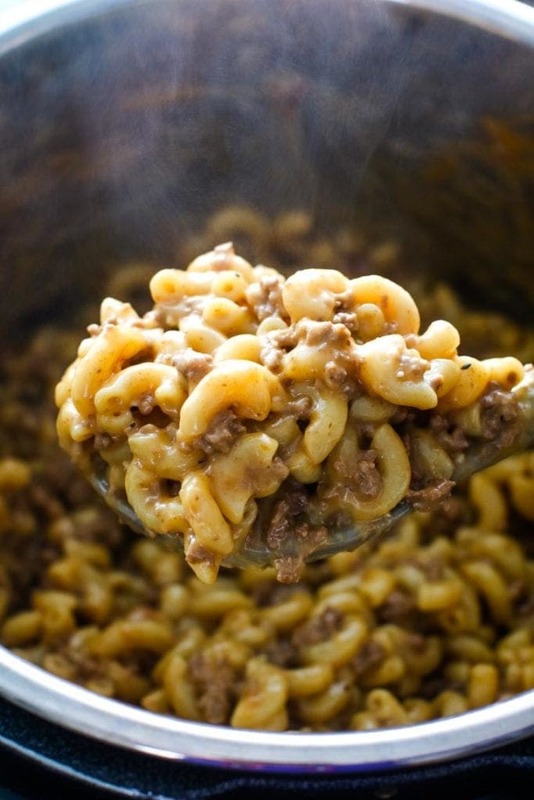 Put the box away and make this homemade hamburger helper. 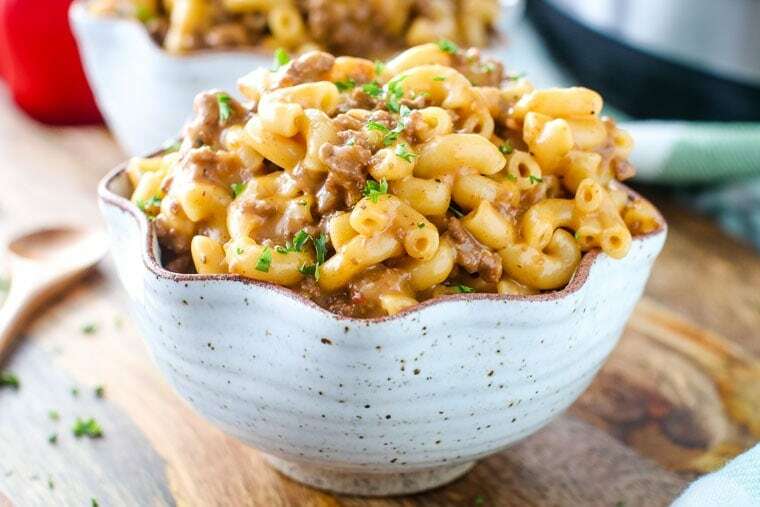 This Instant Pot Hamburger Helper is quick and easy, plus the entire family will love it! It brings me back to my childhood and I remember eating it at my parent’s table. The flavor is amazing and I love that it’s an easy dinner recipe in my pressure cooker. Put this Cheeseburger Macaroni on your regular rotation! If you were like me, you grew up eating Hamburger Helper, right? It was always a favorite meal in our house! And I know it was a favorite for Mom too because it was quick and easy to make. We ALL love that! BUT, now that the holidays are here and gone you have one gift you haven’t opened yet, right? Or well maybe you’ve opened it, but you’re not quite sure you want to cook with it yet? I’m talking about your Pressure Cooker or Instant Pot! The pressure cooker can seem a little daunting, right? Well, I’m here to tell you, don’t be afraid! It’s really easy to use, so if you’re new to the IP (short for Instant Pot) let’s start with this simple easy recipe! If you’re an old hat and you’ve been using your pressure cooker for some time, then great! Either way, you’re going to love this recipe! Let’s get started by answering some quick questions. Pressure cookers actually have a built-in safety feature that will not allow you to open the lid until it’s safe. Don’t worry, the top won’t blow off! Because forceful hot steam is released when the pressure valve is opened, be sure to place it on a counter away from the bottom of your cupboard so it can vent easily. Don’t overfill it. Be sure to follow the recipe and the manufacturers’ instructions. Does that make you more comfortable? GREAT!! 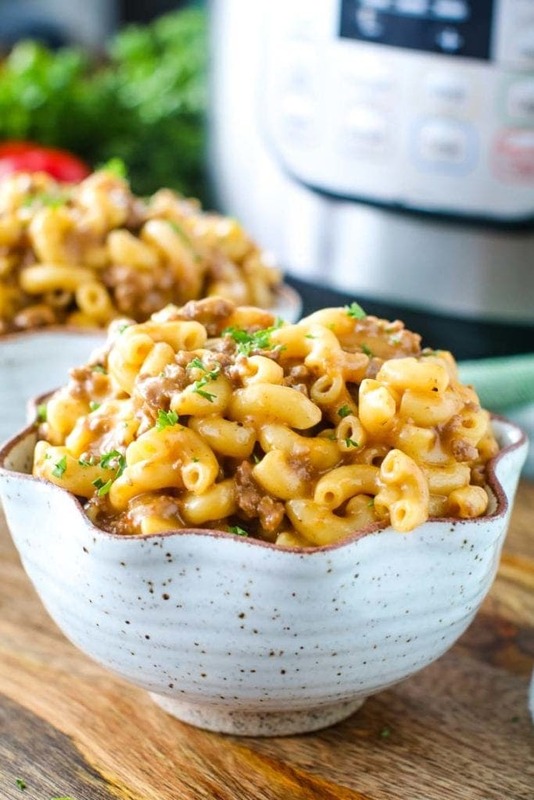 Now let’s talk about how to make this super delicious, quick and easy Instant Pot Cheeseburger Macaroni! I developed this recipe because my most popular recipe on this blog is my Instant Pot Hamburger Stroganoff and these recipes are like brother and sisters… different yet kind of the same concept! How do you cook ground beef in an instant pot? The great thing about the pressure cooker is they come with a saute function. You do not have to dirty an extra pan. Set the IP to saute when it’s time to brown the ground beef. 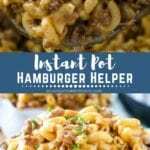 Can you cook hamburger helper in instant pot? From start to finish yes! It will be 100 times better than what you get in a box! Add the oil to the pressure cooker and set to sauté. Next, add ground beef and diced onion. Brown the ground beef, about 5 minutes. Season with garlic, Worcestershire sauce, tomato paste, salt and pepper. Cook for 2 more minutes. Pour in 1/4 c. of beef broth and scrape the bottom of the pot to release any pieces of beef that may be stuck to the bottom. Add the rest of the broth and macaroni. Stir well. Lock the lid, turn the pressure valve to closed and set the cooking time to 5 minutes. When instant pot beeps and is done cooking, quick release the steam valve. Stir in the cheese until melted and combined. See?!! 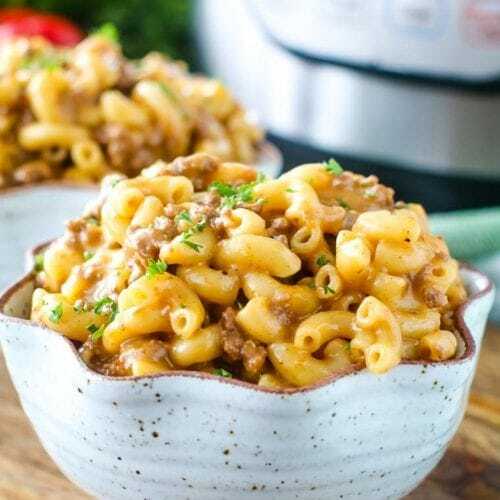 Instant Pot Cheeseburger Macaroni is easy, delicious and made in the pressure cooker takes no time at all! I really hope you give this a try and when you do, be sure to come and comment below and give me five stars for this tasty recipe! I know everyone in your family will love it as much as we do – even your picky eaters!! I have lots of Instant Pot Recipes on the blog – be sure and find your new favorite recipe! p.s. before I go let me see if I can entice you a little more into using your pressure cooker …. Did you know it’s dishwasher safe? Yup! The stainless steel cooking vessel can be placed right into your dishwasher! Even the top can be put in there! Just be sure to place it on the top rack! 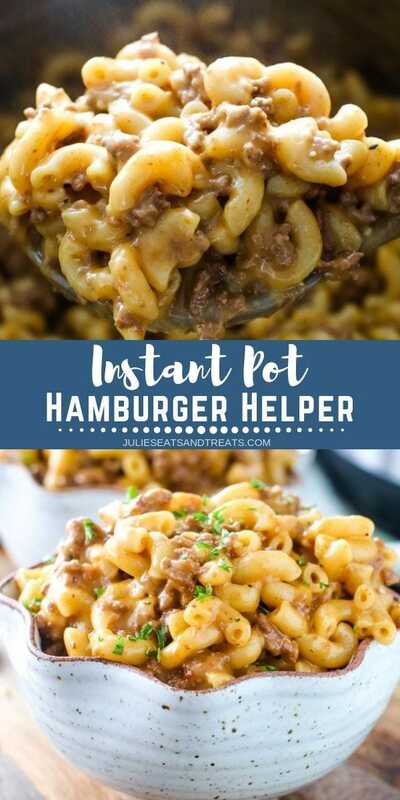 Instant Pot Hamburger Helper is quick and easy, plus the entire family will love it! The flavor is amazing and I love that it's an easy dinner recipe in my pressure cooker. Put this Cheeseburger Macaroni on your regular rotation! Add vegetable oil to instant pot and set to saute. Add ground beef and onion. Cook and crumble until ground beef is cooked is almost cooked through, about 5 minutes. Add garlic, Worcestershire sauce, tomato paste, salt and pepper to pot. Cook for an additional 2 minutes. Pour in 1/4 c. of beef broth and scrape the bottom of the pot to release any pieces of beef that may be stuck to the bottom of the pot. This will prevent the burn indicator on the instant pot when pressure cooking. Add the rest of the broth and macaroni. Stir and make sure the macaroni is submerged into the broth. Lock the lid, seal the valve and set the pressure cooking time to 5 minutes. When instant pot is done cooking, quick release the steam valve. Stir in the cheese until completely melted and combined. Homemade “hamburger helper” is a million times better than the box! Using the instant pot makes it all the easier! It doesn’t get any better than homemade hamburger helper!! And thanks for making an IP version!! Got that right! Such a family favorite! This is all the comfort! Another great recipe for my instant pot! Can never have to many IP recipes! I remember this from my childhood, love how much easier it is to make now! I haven’t had this since I was a kid! I totally want to make this now! I don’t have a pressure cooker can I make this over the stove. Thank for your time. I’ve never had hamburger helper before as i’m from the UK, it’s simply not something we have there. However it sounded absolutely delicious after looking at the recipe so I gave it a shot. It tasted amazing, and is extremely filling too! I didn’t make any major alterations, just a little more tomato paste and I measure the salt and pepper out to half a teaspoon of each. Excellent job! I’ll definitely be making it again. Thanks!